I just cleaned out the chicken coop in the rain which at times today is turning into fat wet snow flakes just to mock me. I know good and well we will not actually get any real snow today or this year, again. So rather than waiting for a crisp fresh day when frankly I have better things to do I said the hell with the weather, the droppings pits needed emptied. Damn Northwest. It's a flippin mud pit outside and not just because I need retaining walls to redirect all my neighbors' water. My neighbor across the street's property is clunking in to the ravine he backs up to, bless his soul. It. Just. Keeps. Raining (and fake snowing). I'm ready for a little spring, that's all I'm saying. While I'm being negative, let me take a minute to talk to all the people who are looking to get chickens this spring. The chicks are cute, super fluffy, darling little chirps. I wish I could buy a chick a day, I just love them. Chickens are cool too. They either give eggs or meat and I can't argue with that plus there is something satisfying in seeing them peck around the yard at things invisible. The way they crow after they lay an egg or stupidly freak out when a gust of wind blows or a small bird flies overhead or anything else changes in their environment, it's hard not to enjoy them. But you need to know if you are in the Northwest and you have chickens you will likely have some sort of a mud pit and you still have to clean out their coop not to mention feed and water the chickens in the winter. I obviously think it's totally worth it but it's not all fun and games and eggs, it's chores and muck and poo too. On another random note, check out my Camellia flower. The shrub just started blooming and since it's all wet outside and we like flowers in the house my daughter took it upon herself to snip, pull and shake a few down. She's just like me - "Look, a flower, let's cut it down!" When people call you and let you know they have a load of rotting fruit that's all yours if you will come fetch it, you know you have thoroughly made a reputation for yourself. I used to be part of a organization called Gleaners. Gleaners is a wonderful nonprofit organization for those who are willing to pay their dues, donate their time and pick through old, random food to glean what is useful and share that with an elderly or disabled person. The program saves amazing amounts of food from the landfill while helping feed thousands. I am no longer a part of the group but luckily I have not been forgotten. When I recently received a call from a member about some rotting pomegranates, I was all over it. I was expecting cases of actual pomegranates so imagine my delight when I realized it was cups the seeds already separated from the fruit! Pomegranate wine, beg no more, I'm on it! You can make pomegranate wine any number of ways with varying ingredients and methods. I have sifted through recipes online as well as in my amazing book all about fermenting, "Wild Fermentation" by Sandor Ellix Katz, which focuses on natural fermentation capitalizing on the yeasts and sugars in plants, to come up with this recipe. I won't know if it's good for close to a year so stay tuned. I will rack the wine several times over a year's time, sampling it frequently. I look forward to seeing how it turns out and I'll keep this page updated. 1 pound - Raisins ~ The raisins add sugar, flavor, body, and nutrients. Getting them organic ensures there will be no sulfates not to mention the regular benefits of organic like reducing exposure to toxins. If your raisins aren't organic just rinse them before use. 1 pound - Dried Black Currents ~ The black currents are because they were next to the dried raisins in the bulk section and they were begging me to use them. If you don't want to use a pound of dried black currents, use two pounds of raisins. 4 - Oranges (peel only - grated) ~ Since we are using the peel organic is best. 4 - Lemon (peel only - grated) ~ Same story, organic if possible. 12 cups - Sugar ~ Yes, I used organic. In addition to being safer, I anticipate a nice flavor from the maple like characteristics found in organic sugar. Using a sanitized food grade 5 gallon bucket add enough water to the pomegranate seeds to cover, probably a couple quarts, and let it sit for a few days. Stir it frequently throughout the day. I like to keep the bucket in or near the kitchen so it will not slip my mind. After 4-5 days the mixture should be bubbling and smell like it is fermenting (aka rotting). Add the raisins, black currents, orange and lemon peel, water and sugar. Let it go a few more days and enjoy watching the bubbles go crazy every time you stir the mixture. After 2-3 more days and especially if you notice less bubbling, add the packet of Champagne Yeast. Watch and stir 3-4 more days. Let the bubbles and smell dictate when you add the yeast and when you think it's time to strain and transfer to a carboy. In warmer conditions this process could take just a few days total, in colder temperatures it could take a couple weeks. Be flexible and go with your gut - it doesn't actually matter that much, the fruit is going to ferment no matter. The most important thing is to stir often, no less than 4 times a day I would say, to ward off mold from forming on the surface and to promote fermentation. By now most of the juice will be separated from the pomegranate seeds. Strain out the solids reserving the beautiful crimson colored liquid. To strain I used another 5 gallon bucket. Transfer the mixture through a fine mesh colander one batch at a time, reserving the solids. After the initial straining, filter the wine once more using a thin cloth. Place a sturdy cheese cloth, a Birdseye flat cloth diaper or any thin sheet of fabric over the strainer and transferred the wine back into the rinsed original bucket. You will need to rinse the cloth several times as the sediment clogs it. After the final straining take the solids which will still have some juice in them and tie them up in a fresh cloth over a long wooden spoon. Hang the pouch over a bucket to drip overnight. I was able to extract another 4 cups of liquid by doing this - that's one more bottle of wine! Transfer the wine into a carboy pouring it batch by batch into a funnel resting in the carboy. If you don't have a funnel, just aim properly. Insert the airlock and you're finished for a few weeks! I will leave the wine alone for about 3 weeks or so before I rack it and then I will wait about 3 months between each racking for a year's time. Have your brew shop get you hooked up with the correct size rubber stopper and airlock. I assume most 5 gallon carboys use a size 7 stopper like mine. Insert the airlock into the rubber stopper. Do not fill the airlock with water before you put it into the carboy or it will be prone to popping off. Dry the inside of the carboy lip as well as the stopper. Push it while twisting. Do not push in more than half way. You don't want to get a rubber stopper stuck in your carboy. It's a hassle. It just needs to be in tight enough to not pop out. Fill the airlock with water to the fill line. UPDATE - 3/15/12 I Racked the wine for the first time. I'm blog hopping at Frugally Sustainable! We have been having some real fresh sunny days here in the Northwest and I am aching to dig in the earth and plant some seeds. Last year I started out by building some raised beds. I used the same spot I had used the year prior only instead of digging up grass and amending the earth any further I covered the space with cardboard and added some raised beds! Yard Prep I had to level the ground a little but didn't take too much care with that. Cardboard helped to expedite the death of the grass and weeds and I didn't have to worry about removing it since it decomposes so quickly. 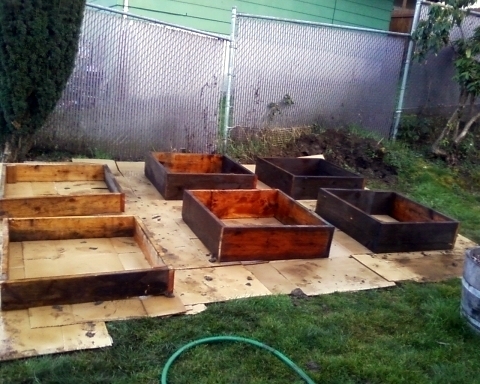 Wood Instead of using expensive cedar for my garden beds I salvages some sturdy lumber that was already cut in dimensions suitable for my task. I nailed the boards together using 16d nails. I didn't for this but have since learned that pre-drilling where I was going to sink these nails could have saved me much time and frustration The dimensions for the back four beds are about 3.5'x3.5' made out of 2x10's and the front two are the same only 6" high. All the boards cost me $20 total. Something new that would be suitable for this task would have cost me well over $100. These beds have at least 5 years to give me and probably more. Dirt I ordered dirt from a close by landscaping yard. They helped me figure out how much I needed. The delivery charge was something like $20 and it was well worth the money to have the dirt dropped off at my driveway. Stone I wanted a visual separation for my garden as well as a divide between the grass and the beds so I partitioned it off with half buried stone which I purchased for half price at a landscaping yard - it was a discontinued brick. Ground Cover Instead of live ground cover, rock or bark I used hazelnut shells in between the raised beds. They are supposed to help keep the slugs away but I really just chose them because I think they are pretty. They have been a fantastic weed control. Trellis After the initial beds were build and planted I added some trellis' for my peas and later green beans to climb. Attaching posts and twine to raised beds for climbing plants is extremely easy. I screwed in some 1x2's to each side, crossed them at the top with another 1x2 and ran string from the top board down to screws half drilled in on the raised bed frame. Free - Compost from my back yard. I had to get this in here. It pays to save your kitchen scraps, yard clipping and chicken poo. $20 - Stones plus a bag each of gravel and sand to go under them for drainage. I should have just used gravel. The sand was a bad idea, it allows the stones to move and drift. I don't know what I was thinking. This is a modest garden but certainly more growing space than if I didn't have one at all and I pack a lot of plants into this rich yummy soil. I also plant throughout the rest of my yard and that helps boost my little space's growing power! Whatever your goals for this spring and summer are, I hope you have a blast achieving them! Growing veggies is one of my favorite things to do. A month before I was expecting anything, here it is! Our first egg! Actually we got our first two eggs. I'm still not sure if I just missed the actual first and by the time I saw it the chicken had laid two eggs or if we have two layers already. The eggs are from our bantams. They are tiny, precious, light brown, smooth, strong shelled eggs. The first one was on the ground outside the coop fence where Luna had flown the coop and didn't have access to the nesting box. I used this as motivation to heighten the fence so she can't so easily fly over it. I like the chickens to be out when I let them out, not when they decide. It's safer that way. The second egg we found was inside the nesting box, just where we like it! It is a shade lighter than the first and the same shade as all the eggs we have gotten since, one a day! Here are both eggs side by side. This is my beautiful daughter holding Luna the Bantam Barred Plymouth Rock that layed the egg outside of the coop. If there are two chickens laying and it's not just Luna, the second layer is my Partridge Silkie Bantam, Samwise Gamgee.